Avengers: Infinity War continued to beat estimates on Sunday, leading to an even bigger weekend performance than expected. Infinity War earned $257.7M in its domestic opening weekend, surpassing Star Wars: The Force Awakens ($248M) and setting a new box office record. Marvel Studios’ 19th film also had the highest worldwide opening weekend in history with $640.5M. That’s almost $100M better than the previous record set by The Fate of the Furious ($541.9M). By the way, Avengers: Infinity War shattered that record without China (the world’s second largest movie market), as the film doesn’t open there until May 11! How did Avengers: Infinity War do it? Besides being an awesome movie that audiences loved enough to give an “A” CinemaScore, the film had the best Saturday ($82M) and the best Sunday ($69M) in North American box office history. The major boosts on Saturday and Sunday propelled the film to the best weekend ever after starting with the the third best Friday ($106M). First and foremost, credit must go to directors Joe and Anthony Russo, writers Christopher Markus and Stephen McFeely, and producer/Marvel Studios President Kevin Feige. Together, they and several other collaborators put together an incredible cinematic experience of unprecedented scale that brought together and paid off so many creative threads from ten years’ worth of extraordinary storytelling in the Marvel Cinematic Universe. Infinity War is, quite simply, one of the greatest blockbusters of all time. Of course, quality does not always guarantee box office returns. The marketing and publicity departments at Marvel Studios and The Walt Disney Studios must also be recognized. Their campaign combined the thrill of seeing all of the characters and storylines audiences have loved culminating in Infinity War with a powerful nostalgia kick by celebrating Marvel Studios’ tenth anniversary at the same time. 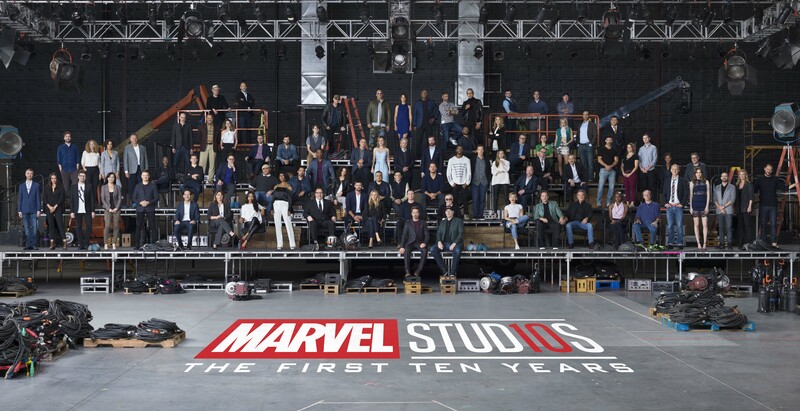 The anniversary celebration, as seen in the “Class Photo” and a number of video featurettes, doubled as Infinity War marketing. That was especially helpful considering that no one wanted to give away too much from the actual movie. Speaking of spoilers, Disney and Marvel Studios launching Avengers: Infinity War like a Star Wars movie also worked extremely well. The junket happened before any screenings, just like the last three Star Wars releases, and no one in the press saw Infinity War until the world premiere last Monday, just days before the film hit theaters. The spoiler sensitivity was turned into a popular hashtag “#ThanosDemandsYourSilence” by the Russo Brothers, who asked press and audiences to be courteous to one another and not spoil the movie. It was a nice public service announcement, but it also sent the clear message to audiences that they needed to see Avengers: Infinity War right away, so as not to be spoiled and be rewarded with major surprises (which the film delivered). Marvel Studios and Disney also did a masterful job in keeping moviegoers focused on this movie. Sure, there’s another Avengers film next year, but that doesn’t make Infinity War a mere “Part 1” that can be rented before heading to the theater in 2019. Infinity War was marketed as a must see event in its own right and audiences have agreed. Avengers: Infinity War is a monumental achievement in so many ways for Marvel Studios, including these box office records. As blockbuster cinema goes, it’s an all-timer that generations of moviegoers will remember seeing for the first time. Its box office records will also keep Infinity War in the conversation for years to come, even if another film, like perhaps Avengers 4, moves it off the top spot(s). Avengers: Infinity War adds to the outstanding legacy of Marvel Studios, which grows more impressive with the release of each film. Marvel now owns three of the top six domestic opening weekends of all time with Infinity War, The Avengers ($207.4M), and Black Panther ($202M). Add in Avengers: Age of Ultron ($191.3M), Captain America: Civil War ($179.1M), and Iron Man 3 ($174.1M) and Marvel Studios has six of the top ten domestic openings. Those films also combine to give Marvel Studios each of the six best domestic opening weekends in superhero cinema. The Marvel Cinematic Universe is now a legitimate challenger to Star Wars as the biggest, most powerful movie franchise in the world. No other series has belonged in that conversation for decades, but the MCU certainly does, as Avengers: Infinity War has just shown that for many, many moviegoers, this is their Star Wars.